- Publisher The institution of marriage is under attack by the enemy. Most couples believed that their marriages were made in heaven. After a few months or years, it appears as though the marriage made in heaven is on the brink of disaster. Most marriages are either: thriving, striving, surviving, or dying. This book attempts to help couples improve their marital relationship. It is especially helpful for those couples who are struggling to survive. This book provides information for husbands and wives to put their marriages back on track. It also provides insight for the single person planning to marry to read and learn about marriage from a biblical perspective. - Publisher The institution of marriage is under attack by the enemy. Most couples believe that their marriages were made in heaven. After a few months or years, it may appear as though the marriage made in heaven is on the brink of disaster. Most marriages are thriving, striving, surviving, or dying. This book attempts to help couples improve their marital relationship. It is especially helpful for those couples who are struggling to survive. Provides information for husbands and wives to put their marriages back on track. It also offers insight for the single person planning to marry, by reading and learning about marriage from a biblical perspective. 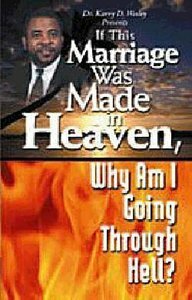 About "If This Marriage Was Made in Heaven, Why Am I Going Through Hell"
The institution of marriage is under attack by the enemy. Most couples believed that their marriages were made in heaven. After a few months or years, it appears as though the marriage made in heaven is on the brink of disaster. Most marriages are either: thriving, striving, surviving, or dying. This book attempts to help couples improve their marital relationship. It is especially helpful for those couples who are struggling to survive. This book provides information for husbands and wives to put their marriages back on track. It also provides insight for the single person planning to marry to read and learn about marriage from a biblical perspective. The institution of marriage is under attack by the enemy. Most couples believe that their marriages were made in heaven. After a few months or years, it may appear as though the marriage made in heaven is on the brink of disaster. Most marriages are thriving, striving, surviving, or dying. Wesley serves as the senior pastor of the Antioch Fellowship Baptist Church in Dallas, Texas. He is also the founding director of Rivers of Grace Ministries, Inc. He received his Bachelor of Arts from Bishop College in Dallas. Later he received his Masters of Divinity from Brite Divinity School in Fort Worth, Texas and his Doctors of Ministry from Phoenix Seminary in Phoenix, Arizona.